After a 26-year ban on British beef and lamb, British meat producers face tough competition to attract Russian consumers. Moscow has lifted a 26-year ban on imports of British beef and lamb, and given two companies the go-ahead to export their meat to Russia. This was announced by the Federal Service for Veterinary and Phytosanitary Surveillance (Rosselkhoznadzor) head Sergei Dankvert last week. The embargo was introduced during the second year of Gorbachev’s Perestroika in 1986 when the first UK cow contracted BSE (mad cow disease). More than 37,000 cases of BSE were reported a year in the first half of the 1990s. Over 200 people died from Creutzfeldt–Jakob disease as a result of consuming BSE-infected meat. British vets only succeeded in stopping the epidemic after a ban was imposed on the use of processed animal protein in cattle fodder in 1996 in Britain (and in the EU in 2001). Animals born before August 1996 were excluded from the feeding chain, official Rosselkhoznadzor documents say. 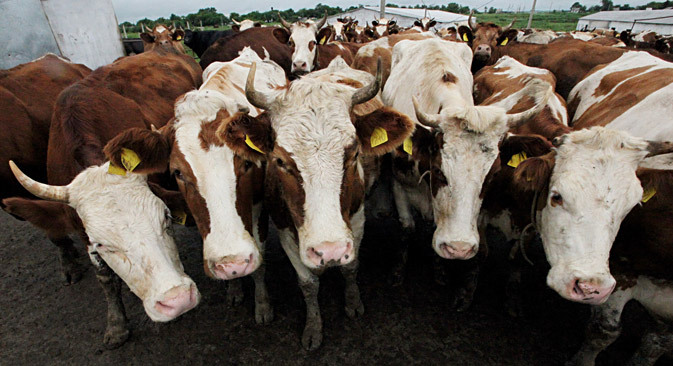 The EU lifted its ban on British beef in 2006 but Russia took a more cautionary approach. To end Russia's ban, the UK’s chief veterinary officer Nigel Gibbens produced evidence detailing the disease's irradication to Rosselkhoznadzor in September. Satisfied with the evidence, Dankvert announced that the first steps in resuming trade would be made. Russian authorities generally take a fairly tough approach when it comes to phytosanitary inspection of imported products. They banned meat imports from the United States and Australia this October, denied eight Ukrainian meat and dairy companies from exporting their products to Russia in September, and declared that Norwegian salmon was off-limits in May. The same day the lifting of the British meat ban was announced, eleven German companies were found to be giving inaccurate certification of the origin of their animal products and were consequently given a ban on exporting their meat and dairy products to Russia. The two British companies given authority to trade with Russia, which are listed as UK 5513 (a beef producer) and UK 8216 (a lamb producer), pave the way for other companies to start exporting meat to Russia. However, Rosselkhoznador said it needs to see a demand for British meat before further imports are given the go ahead. These companies will have a lot of competition in getting Russians to buy their products and will have to market their meat carefully to appeal to Russian consumers. American and Australian steak is widely consumed in Russia and consumers have recently been introduced to Argeninian and Brazilian beef too. "Cooperation with South American suppliers is growing fast, mostly because these countries don’t distort the real prices of their products with various hidden subsidies," Dankvert explained. Brazil’s share of the Russian beef market now exceeds 40 percent, according to Meatinfo.ru trade web portal analyst Anna Yevangeleyeva. Russia is also gradually building up its own meat production. According to Yevangeleyeva, growth will reach 8 percent this year, driven mostly by pig and poultry breeding. They are the most attractive sectors for investors in terms of payback. The poultry sector has been growing particularly fast, with imports falling 50 percent since 2007. However, this growth could well be affected by the sharp hike in fodder prices which followed last summer’s drought. The prospects for British lamb farmers are slightly more promising. Demand for lamb has been rising by 5 to 10 percent a year. Experts say the rise is a direct result of immigration of Central Asian Muslims to Russia. But domestic production of lamb is also growing too. Russia imported just 6,400 tonnes of lamb and goat meat between January and September 2012, 4.4 percent less than last year, Meatinfo.ru reported. Currently lamb isn’t a staple food for the typical inhabitants of Central Russia, who generally prefer to eat beef, pork or chicken. But hopefully, with the right marketing, British lamb could be on their menus too.